This 1950’s ranch style home needed an upgrade to allow the homeowner to better enjoy their backyard. 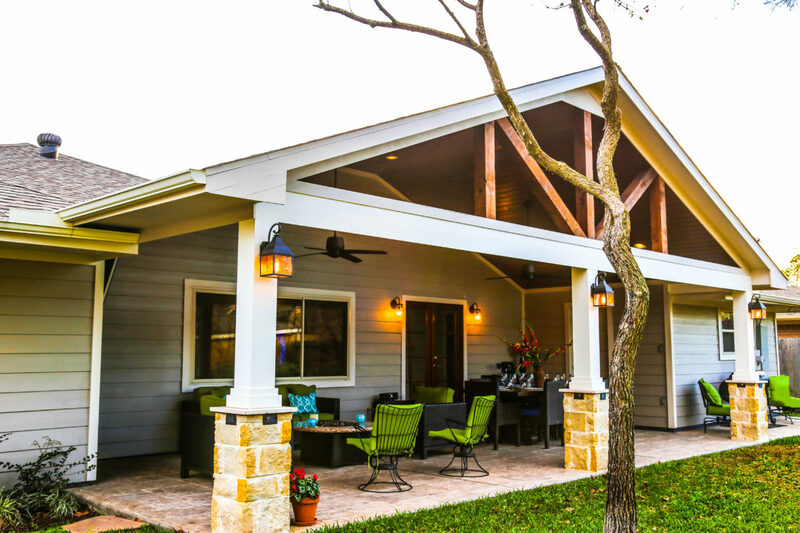 The gabled roof we created gives the homeowner an open and expansive feel for the 434 SF patio cover. The ceiling is a stained pine tongue and groove and the gable truss is cedar. This space provides enough room to allow for a sitting area and dining area. The home did not have any masonry on it, so to keep it original looking, we only added stone to the bases on the columns. We added decorative low-voltage lighting on the column bases to create a perfect night time glow. The flooring is stamped concrete with a travertine pattern. The homeowner was having their entire roof redone, so we coordinated with the roofing company and they were able to re-roof everything at once. Working with their company to coordinate that aspect of the project was not a problem at all for us. This is the perfect space to entertain friends and family – the homeowner has admitted that they eat dinner out here more often than they eat inside. With a table like this under a cover like this … who would want to eat inside?